The week started at SPX 2902. After Monday’s Labor day holiday the market had gap down openings on Tuesday, Wednesday and Friday. Each day of the week the SPX made a lower low: 2885, 2877, 2867 and 2864. For the week the SPX/DOW lost 0.60%, and the NDX/NAZ lost 2.75%. Economic reports for the week were mixed. On the downtick: auto sales, the ADP, factory orders, and the trade deficit increased. On the uptick: monthly payrolls, ISM manufacturing/services, construction spending, and weekly jobless claims improved. Next week’s reports will be highlighted by the CPI/PPI, retail sales, the beige book, and industrial production. Best to your week! The indices we have been tracking did not make any upside progress this week. In fact all of them lost ground as the market pulled back. The DOW was down 0.2%, the NYSE -0.8%, and the DJ World -1.9%. We still expect all three of these indices to make all time new highs, just like the SPX did recently, before the bull market ends. The long-term count remains the same. A Major wave 1 bull market has been underway since February 2016. Major wave bull markets consist of five Intermediate waves. Intermediate waves i and ii completed in the spring of 2016. Intermediate waves iii and iv completed in the spring of 2018. Intermediate wave v has been underway since that April low. We still expect the SPX to reach 3000+ by 2018+ before the bull market ends. The Intermediate wave v uptrend entered its fifth month this week, as it started in early April. We are expecting the uptrend to unfold in five Minor waves. And it appears those minor waves are quite lengthy and subdividing – the reason for the length of this uptrend. Minor waves 1 and 2 ended in June at SPX 2791 and SPX 2692 respectively, and Minor wave 3 underway since then. Currently Minor 3 (225 pts.) is slightly shorter than Minor 1 (237 pts. ), and also does not look complete. We have been counting SPX 2863 and SPX 2802 as Minute waves i and ii, and the SPX 2917 all-time high as the first wave of Minute iii. See hourly chart below. SPX 2917 could have actually been all of Minute iii, even though it is quite short compared to Minute i. 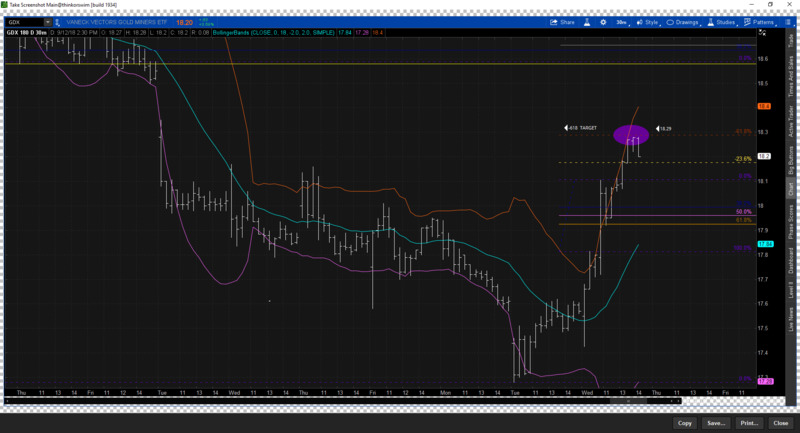 Suggesting Minute v would also be quite short, and probably top around the OEW 2929 pivot. If the SPX drops below 2863 that possibility is eliminated. As noted earlier Minute waves i and ii of Minor wave 3 completed at SPX 2863 and SPX 2802 respectively. Minute wave iii has been underway since then. While Minute i subdivided into five quantified waves. Minute iii has thus far not subdivided at all. It has been one straight up rally. Leading us to believe it is only the first wave of Minute iii, and this pullback is wave 2. After this pullback concludes the market should rally to higher all-time highs. Short term support is at the 2858 and 2835 pivots, with resistance at the 2884 and 2929 pivots. Short term momentum ended the week with a positive divergence. Best to your trading! Asian markets were all lower for the week and lost 2.0%. European markets were also all lower and lost 3.0%. Bonds continue to uptrend but lost 0.4% for the week. Crude appears to be in an uptrend, but lost 2.9% on the week. Gold appears to be in an uptrend too, but lost 0.5% on the week. The USD appears to be in a downtrend and lost 0.1% on the week. Monday: consumer credit at 3pm. Tuesday: wholesale inventories. Wednesday: the PPI and the Beige book. Thursday: jobless claims, the CPI, and the budget deficit. Friday: industrial production, retail sales, consumer sentiment and business inventories. Oh Mr Kendo oh way oh way oh way! combination of buy the close and cover your shorts should push to 2895 then as always simply gap over resistance in the morning. new highs by Friday. GDX is still embedded.Close to exiting,but a selloff into the close would make the whole day a mirage.Ira mentioned gold,over 1212.70,opens the door to higher price counts–1219 and 1240.That’s it from here. Gold/GDX did it again…NOTHING.Maybe tomorrow,but a giveback of 2% would not surprise me.GL all. strong enough to cause pivot to fail? Page – good call. I missed it 😦 Waiting for a pullback. Looks like a great move is brewing in commodities and currencies. Gold just crossed 50 DMA, any pullback will be short lived, expecting Gold to print 1240-1280 area. This is why I don’t day trade. The unsuspecting intra-day traders would have been whipsawed on both sides with today’s price action in SPX, if they were trading based solely on momentum. Much safer and easier to play the weekly swings from the extremes and the medium term. Still comfortably long from last week at 2869-72. Once SPX starts trading above 2900 again I’ll be on the lookout for signs of exhaustion. both $SPX and $NDX bounces stopped at the red trend line, bear flag line. $NDX, even weaker, leading down. fyi, my averaged shorts cost base 2902, after two rounds of successful hedge trades. I still think nothing materially has changed, and there is further downside….2832 is an interesting number in the sequence. And yes TLT and TBT are much of a muchness….equilibrium. GLD is still down to 95, and GDX to 13….a real washout. Oil has changed sequence and suggests 83. Remember an inflection point exists when a function changes concavity. Jack, I don’t know how much experience you have with harmonic patterns, but there’s usually some symmetry in them. While the XA leg is usually the longest one, the sum of B, C and D legs should be at least as long. XA took 7 trading days to form, and from A there’s only 3 days so far so I think there’s more before any harmonic patterns finish forming. My eyes are on your 0.786 at 2905 and on the 1.272 fib at 2931. Of course SPX doesn’t really need any small harmonic pattern to head down now, the huge bearish pattern since January 29th is more than enough, if SPX is going to head south eventually. Congrats on being short on average 2902, it’s a good long term position and I’m sure you can and will weather any upmove above it if it were to happen before the downside starts again. fxaprendiz, you are correct about the symmetry and time. 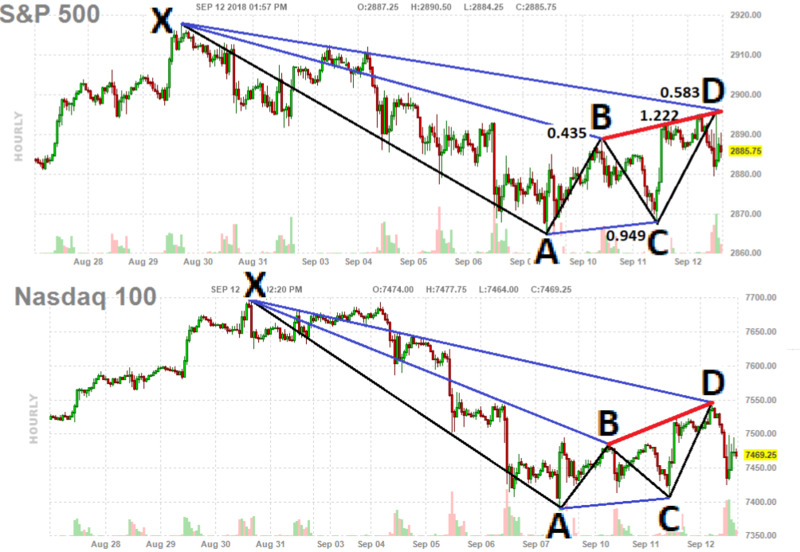 the harmonic pattern should have 2~3 more days to complete the pattern.D leg could be between 2897 ~ 2905. I think we will have sell the news event for AAPL’s new phone announcement, profit taking kicks in. So nice to know there are still people out there who go extra mile to help others. Thanks. Bullish. I’m serious. This is going to be even better than last year’s hurricane money. Almost not even fair how easy this is.